How often do you access the internet when you are traveling, grabbing a quick lunch at your favorite restaurant, or while relaxing after dinner? Quite often, isn’t it? And not every time you access the internet, it is on the laptop. With a lifestyle that requires you to be constantly on the move, while also looking up for information, accessing internet across a range of devices becomes a necessity. In a blog post done earlier, we’ve spoken about how internet usage has shifted from being restricted to a laptop/desktop to devices like tablets and smartphones. The need for such accessibility also requires that websites be designed in such a way that accessing them on different devices does not make browsing and navigation difficult. This led to the adoption of responsive web design. Responsive web design is designing and coding websites in such a way that they can be viewed optimally on any device. A responsive website adjusts itself according to the screen resolution of the user’s screen so that the user’s experience is not hampered in any way. Given how much internet usage is spread across devices, it comes as no surprise that responsive web design has now become an industry standard. Adopting responsive web design becomes even more essential when your digital marketing strategy strongly focuses on SEO. Customer is king and if something guarantees good user experience, then nothing like it. After all, user experience plays an important role in retaining existing and procuring new customers. But this isn’t the only advantage that responsive web design has to offer. Responsive web design is a one-size-fits-all approach. This means it is not only simplified consumption for end users but also simplified development and management for developers. Studies show that users navigate away from a website that takes more than 3 seconds to load. Web page loading time improves considerably by using techniques like responsive image display and caching along with responsive web design. Responsive dashboard design, as said earlier, is a more simplified approach when compared to designing multiple websites for different platforms. That said, it still has certain challenges that developers have to face when creating a responsive website. Content/element prioritization is one of the biggest challenges designers of responsive websites face. It is important to figure out what needs to change and how it will be changed. Given the limited real estate on mobile devices, rendering complex UI elements, navigation and layouts, and image scaling need a lot of planning. Although responsiveness reduces loading time, adding too many complex elements can slow it down, given that mobile internet is slower. To summarize, when creating responsive websites, sensitivity towards what the user is looking for when browsing the website increases. Development takes more time as the smallest of details are considered and testing rounds are added to check every feature on every device. FusionCharts can be easily integrated with Bootstrap to adopt responsive web design that takes your visualization experience a notch higher. An open-source, front-end framework, Bootstrap’s most significant feature is its responsiveness to the client’s screen resolution. 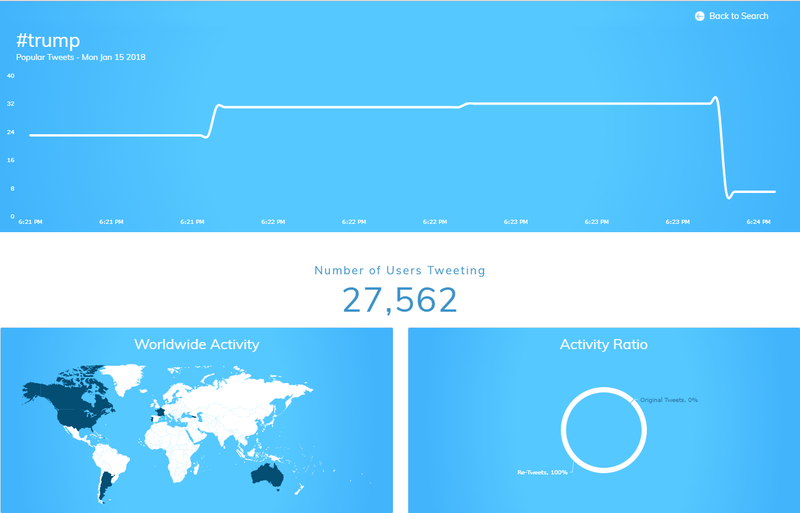 Let’s take a look at an example of a responsive dashboard—FusionCharts’ Real-time Twitter Hashtag Tracker dashboard. In the type #Hashtag to search field, enter the required hashtag. Press Enter or click the search icon button. 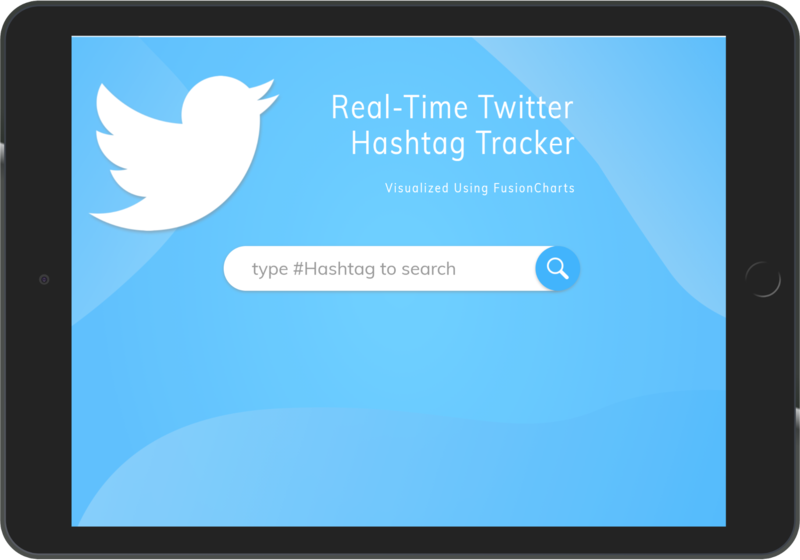 The Real-time Twitter Hashtag Tracker dashboard is created using charts and maps from the FusionCharts library and Bootstrap 3 & 4 along with the Twitter Standard Search API and the TwitterOAuth Library.This dashboard displays the number of tweets tweeted with the searched hashtag at an instance in time. The Twitter Standard Search API returns tweets that match a specific search query. To read more about this API, please visit the developer page. Step 1: Get the OAuth authentication access for the owner of the application. Click here to know about the authentication process. Step 2: Create a PHP file (tweet.php in our implementation) and provide the authentication token for a user’s credentials there. Step 3: Add the search query given below in tweet.php for fetching information in the JSON format for the hashtag searched by the user. Step 4: From the dashboard.js file, perform the AJAX call for fetching the resultant Twitter JSON data so that it can be consumed and relevant information can be visualized using the charts and maps supported by FusionCharts. 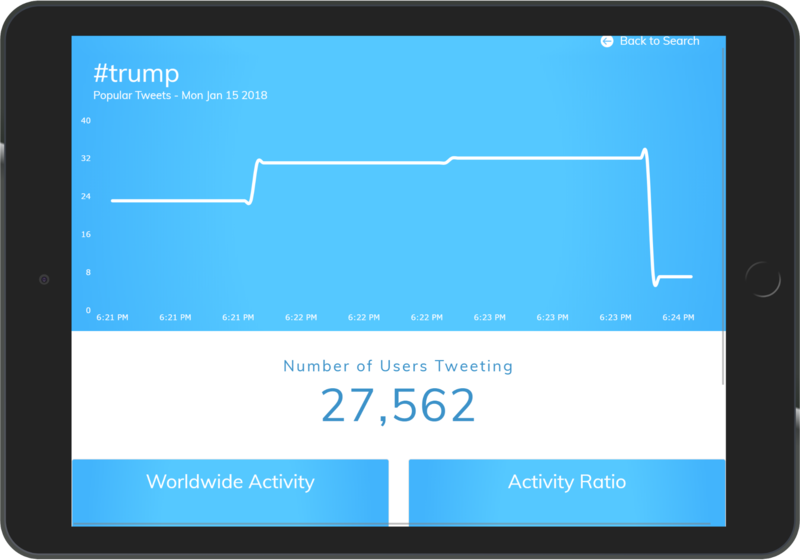 Step 5: Fetch the values from the Twitter JSON data source and convert them into the prescribed JSON structure for FusionCharts for rendering different types of charts. The images here show how the dashboard looks when rendered on different mobile devices.